People who don't know Airbourne need to turn up their hearing aids or crawl back out from under their rocks. The Australian quartet don't come over to the States very often but after releasing their forth stellar album, Breakin' Outta Hell, it looks like they are going to become very in-demand. Opening up with "Ready To Rock" and "Too Much, Too Young, Too Fast" the set started off very aggressive. Front man and guitarist Joel O'Keeffe was on another level of hyper. Running all over the stage it was a sight to see. "Chewin' The Fat," "Rivalry" and "Girls In Black" kept the plane in flight. Ryan O'Keeffe absolutely crushed it on the drums and bassist Justin Street rounded out the powerful rhythm section. "Cheap Wine & Cheaper Women" and "Breakin' Outta Hell" really allowed rhythm guitarist David Roads to shine. Those tunes were killer and featured a very noticeable duel guitar attack. Again, Joel is a star but a team is only as good as all the members and David's quality playing is not to be ignored. he is a very valuable part of Airbourne's sound. "No Way But The Hard Way" and "Stand Up For Rock N' Roll" closed out the main set. 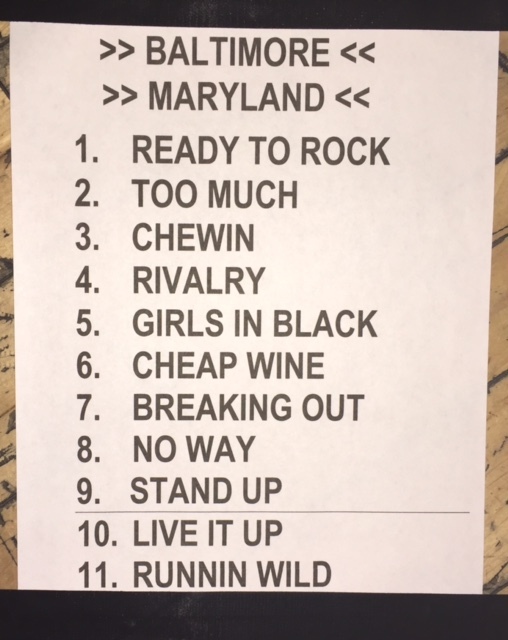 The encore featured "Live It Up" and "Runnin' Wild." Those two songs left the crowd with nothing in their tanks. Heavy and fast is the way to end a show and Airbourne totally delivered. Their name fits because their set is just like a plane dropping bomb. Upon dispatch it builds and builds until impact and explodes. They are the top dogs of the new hard rock bands, take notice.